1. Leave the razor blades in the paper and break along the middle axis with the tip of the arrow pointing up. 2. Keep the unused halves in the paper. 3. 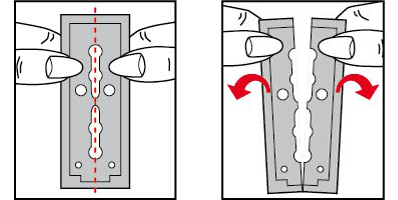 Slide on the razor blade holder, insert the halved razor blade and close the holder tightly again. 1. Place the blade guide on the razor blade and slide on up to the impact point. The razor blade is now fixed in place and can be lifted out to the top. 2. Click the razor blade into the empty dispenser compartment and pull the blade out. To select the desired temperature level (except in the case of CERION 2.0), use the control wheel (80–210°C): For fine hair, use low temperatures for best results. For thick, curly, or unruly hair, choose a higher temperature level. The device will reach the desired temperature in a few seconds. The plates are very warm after just a few seconds. Avoid contact with the skin once the device is on. The straightening iron gets very hot when it is set to the maximum temperature. Do a spot check on a strand of hair first to ensure that the temperature setting is appropriate for the client’s hair type.